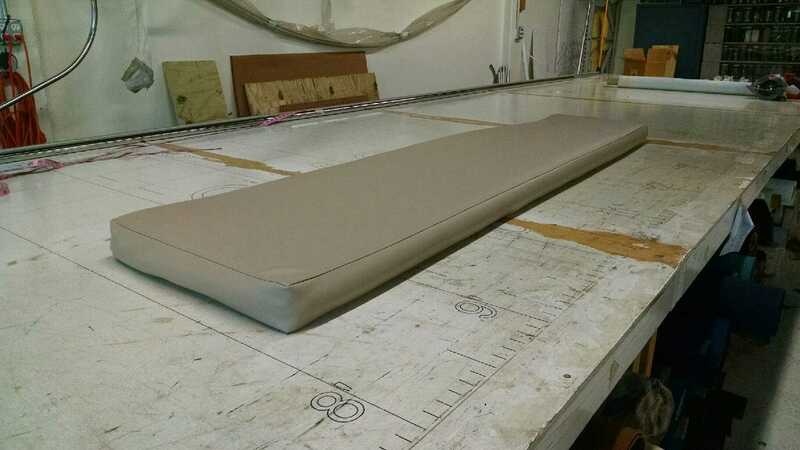 For this sailboat we created twin helm covers and a custom slip cover for their bridge table. We start of all of our jobs by going onsite to take measurements. We use our special 3d measuring device, which is easy and efficient. This process alone saves us time and you money at the end of the day. After we get our measurements we head back to the shop to begin our design process on the computer. 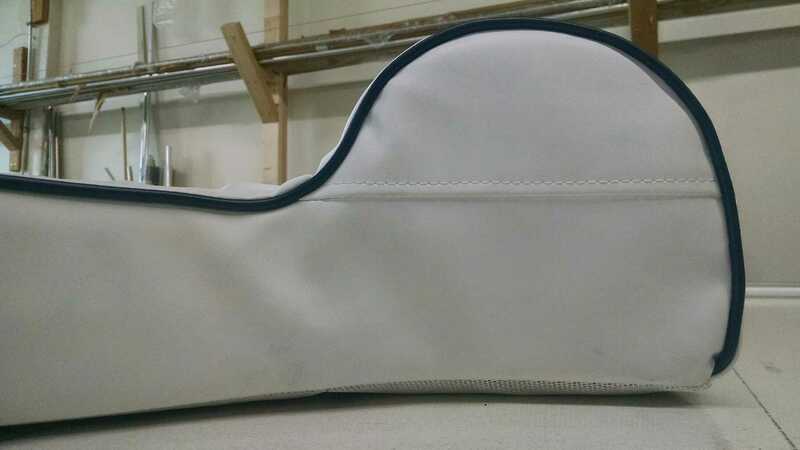 All of our custom covers are designed using CAD (Computer-Aided Design) software. This makes things super easy for us, allowing us to see the design before we sew it all up, that way we can ensure that all of your needs are met and there are no design flaws on our end. After we finish up designing everything, we go to our plotter and draw out all the pattern pieces for our seamstress to sew up. Out plotter is another one of our labor-saving, cost-effective tools. It draws out our design perfectly on the fabric so that everything fits just as it should. After everything is drawn out, our seamstress cuts out all the pieces and gets to work! For these covers we used Charcoal Sunbrella fabric. Sunbrella comes with a 10 year warranty and is fade resistant!!! To sew everything together we used GORE tenara thread. GORE tenara thread is a great thread to use on your new canvas, because it has a lifetime guarantee. 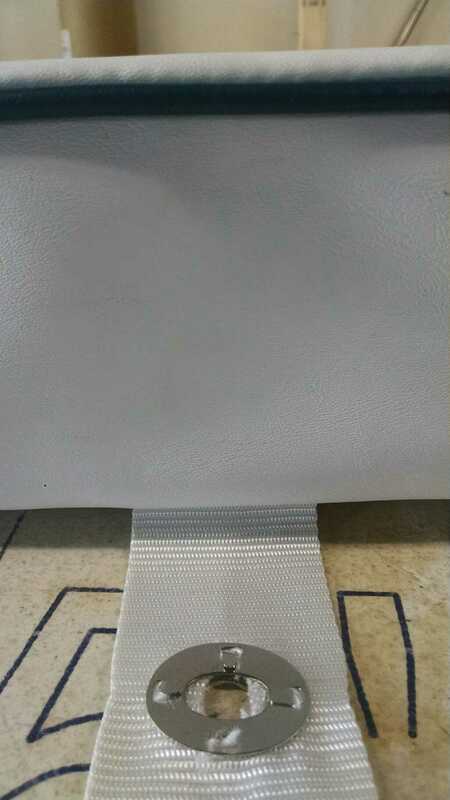 It is chemical resistant, UV resistant, salt water resistant and extreme weather resistant. and Lenzip zippers. For our zippers we use Lenzip. These also come with a lifetime guarantee! 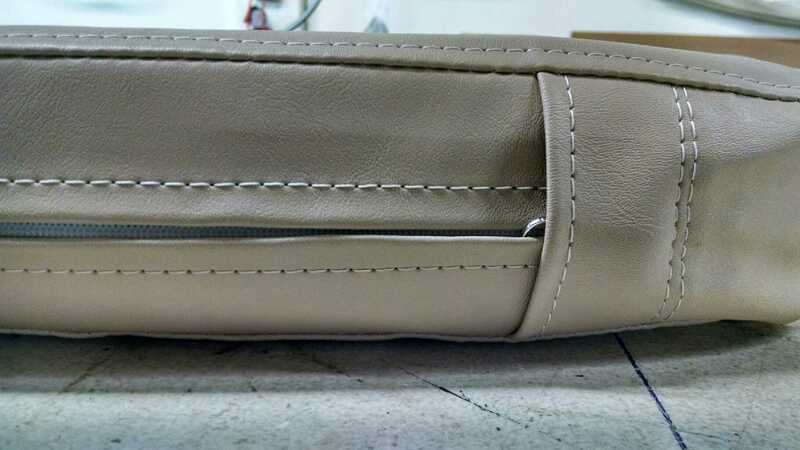 We did a hidden zipper on these to help make them look nice, clean and modern. It also prevents water leakage making sure that everything stays nice and dry. 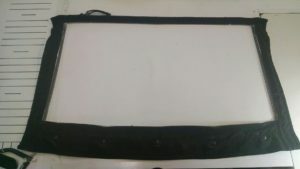 A customer came to us with a roll up window replacement because their windows were yellowing. This can happen over the years, from sun and weather, or even from boat cleaner chemicals getting on the glass. To replace these windows we used strataglass, sunbrella binding, and lenzip’s waterproof chain zipper. Our process to do this is to first take measurements of the windows using our 3D measuring device while the old glass is inside the windows still. We could do it this way because the customer said the windows still fit perfectly, they weren’t too big or small when he put them on his boat recently. After we take the measurements we do the design work on the computer using CAD software. Then we draw out the new windows using our plotting device so they are exactly what we need. Then we cut out the old windows, removing all the old discolored glass. 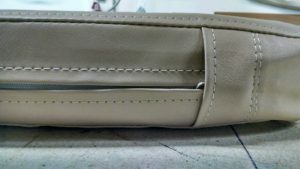 After that we put down seamstick which is a double sided tape that helps keep all of our sewing holes a little more waterproof. 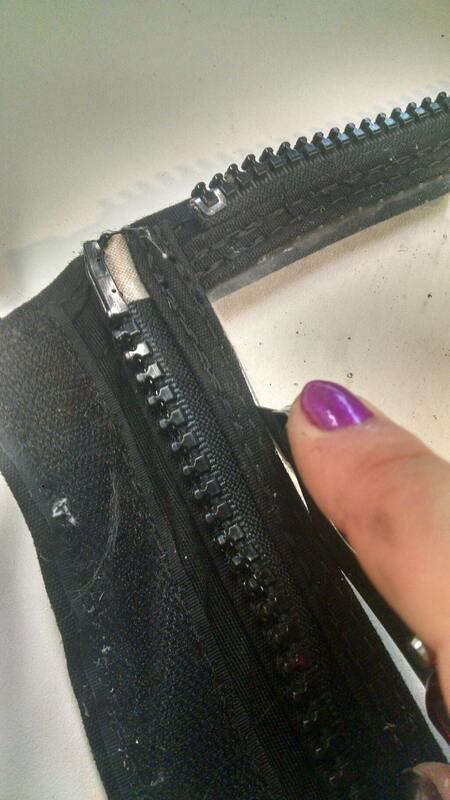 Over time, dirt and outside debris will get in there and stick to the tape, creating a blockage in the needle hole. We put this all along the outside edge of the glass. Then we put that aside, and we do the roll up window. 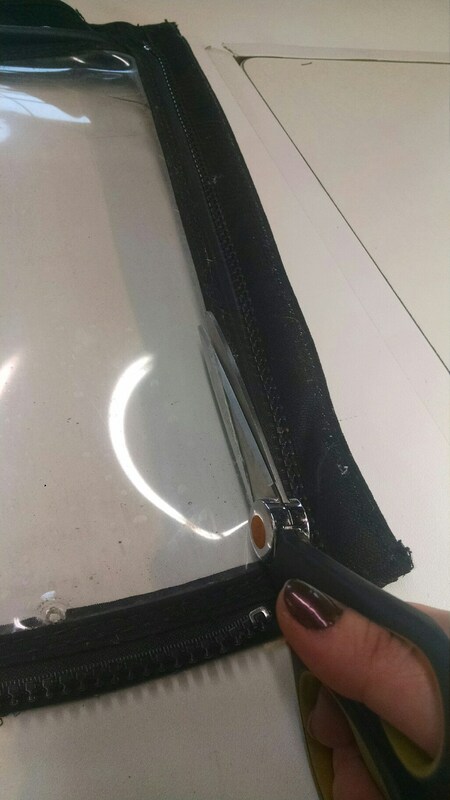 First we put down the water proof zipper, also using seamstick. 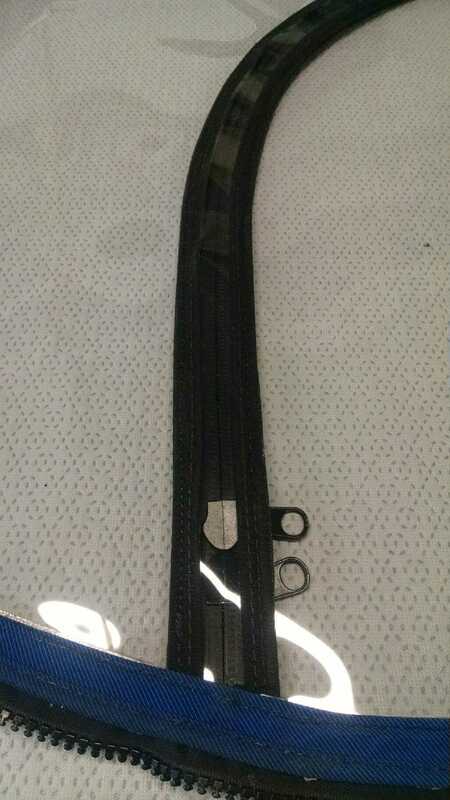 After the zipper is down, we put binding we’ve sew up on the front and back of the window, so it looks nice and clean. After that, we sew down the zipper, then we place the new window into the old canvas, and sew it down. 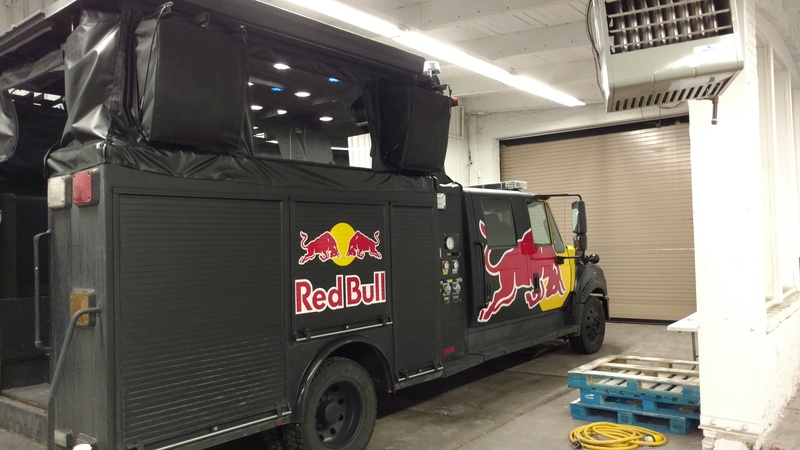 We got a call from Red Bull explaining that they would be needing a cover for their truck that would be touring the country in 2017. They wanted something that would withstand wind, and any kind of weather, and they wanted the cover to be a black matte. 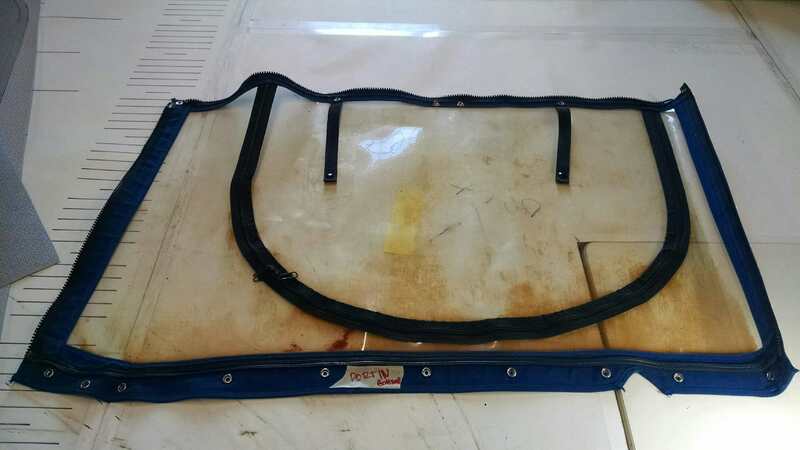 So we instantly knew what kind of materials we were going to use for this cover, we were going to use Stammoid heavy, and makrolon for the windows, and GORE Tenara thread in black for sewing it up. If you are interested in seeing some of the testing on this fabric check out this awesome video done in the labs on how durable this fabric is! For this cover we had to get a little more creative then usual. Since the truck was metal, we sewed in some super heavy duty magnets in the bottom hem, so that the cover would stay secure to the truck and wouldn’t go flapping in the wind when they are driving. We also used keder to attach to the inside bottoms of the cover that slides into a track on the truck to help ensure its secureness to the truck. Over all, this cover came out great and is out on the road as of last week working its way around the country! We re-created these three cushions for a customer. They wanted the same design as their old cushions, so it would still match the rest of their boat. We matched fabric color with a vinyl that was from Ship2Shore. Ship2Shore has many colors, shades, and textures. 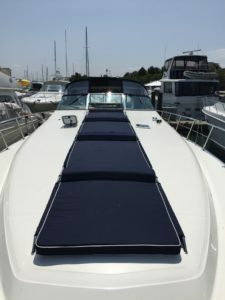 So if you are ever looking to get your cushions re-made to match the other ones on your boat, its a great option, because they have so many options, and you are most likely to find a extremely close, if not exact match to the fabric. After we picked out the fabric, we took measurements of the cushions using our 3D measuring device. Then we go to the computer, and make up the designs in CAD software. After that we take the computer to our plotter and hook it up. 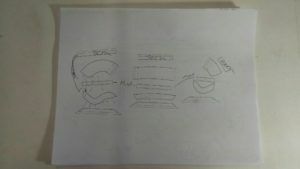 We have the plotter draw out the pattern for the cushions and then hand cut the pieces out. Next we make the piping. After we make the piping, we start to sew everything else together. After we sewed it up, we stretch it over the foam. This customer wanted to keep their old foam, which was fine, because it wasn’t moldy or out of shape. After that we staple the new seat covers down to the bottom boards and then we were finished! We recently had a customer contact us about possible window replacements. So we went out to their boat in storage to check out each panel and see what ones we needed to bring back to the shop to replace. Only two windows had makeshift patches on them. 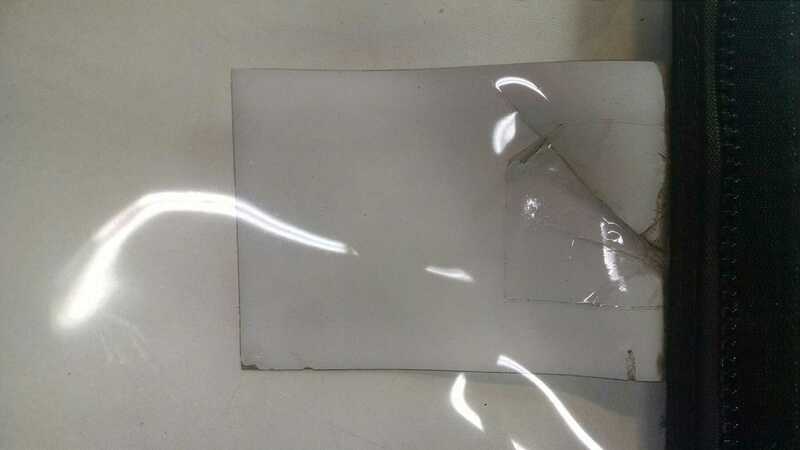 The customer used tape and stickers to help prevent water leakage for the time being. This is a great solution, by the way, for a temporary fix until you can get a hold of your local canvas shop to either ad a patch to the window, or replace the whole window itself with new glass. There are a couple different ways to do window replacements. It all really depends on the weather, and what shape your canvas is in. If its super hot outside, chances are your canvas has a lot of stretch to it. It’s probably easier to put on your boat because the fibers are more relaxed because of the heat. If it’s colder your canvas will be a little more hard and less likely to be so stretchy. This canvas was in pretty good shape and looked rather new. Since it’s winter right now and it’s cold, this canvas wasn’t so stretched out. So we were able to do them both in a couple of hours without having to run back out to the boat and take 3D measurements. So we cut out the old windows out, first using a utility knife to get as close as we can to the edge of the canvas. Then we get in there with a pair of scissors and do the rest of the cutting, the same way, as close as possible to the edge. We want your new windows to look as if, they were magically fixed and like no work was done on them, so this part is very important. After we cut out the old glass, we roll out the new glass and trace out the old windows onto the new glass. There are a few different kinds of glass you can choose. The differences vary in price and quality, as well as how long it’ll stay clear and thickness. This customer chose Strataglass. So we trace out the old glass onto the new glass to use as a reference point as to where the new window needs to line up, that way it fits perfectly. 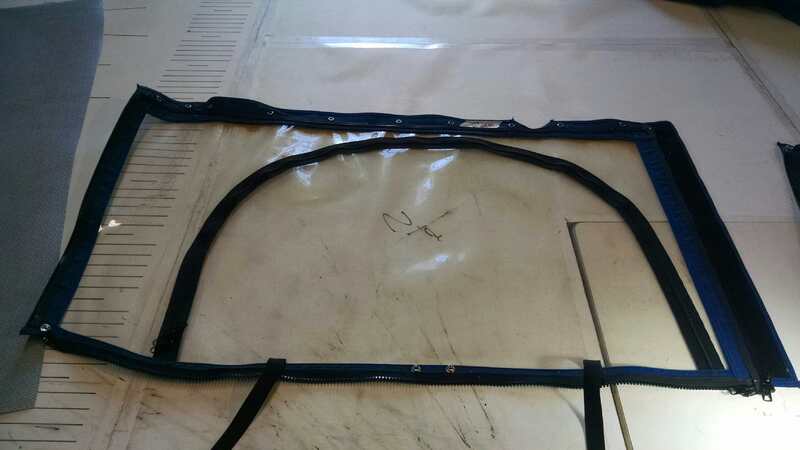 We carefully add an inch of glass around the line we just traced for a seam allowance. Then we put seamstick, which is a double sided sticky tape on the outside of the window where our seamstress will be sewing. Seamstick is just an extra precaution to help prevent water leakage through the needle holes of our sewing. Over time, dirt gets stuck in the holes, and since theres something sticky underneath, it helps block them up, which helps prevent any water from going through the holes. 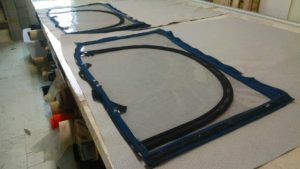 After we apply the seamstick, we line the windows up in the correct spot and sew them in! 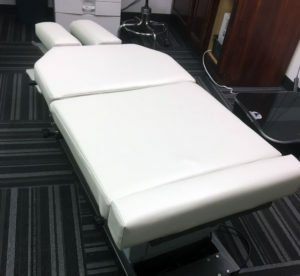 One of our boating customers is a physical therapist and has contacted us a few times to reupholster some of his chiropractic tables. He recently contacted us because another one started ripping around where his clients would put their face. 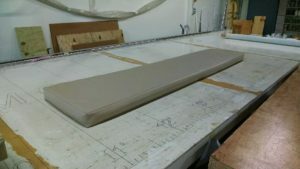 He needed the table to be reupholstered so we went to check it out and began our process. We took apart the bed, bringing all the pieces back to the shop. Then we took our 3D measuring device and took measurements of the bed. After that we transferred all the measurements we collected into the computer. Using CAD software, we did a digital design for the new cover for the bed. 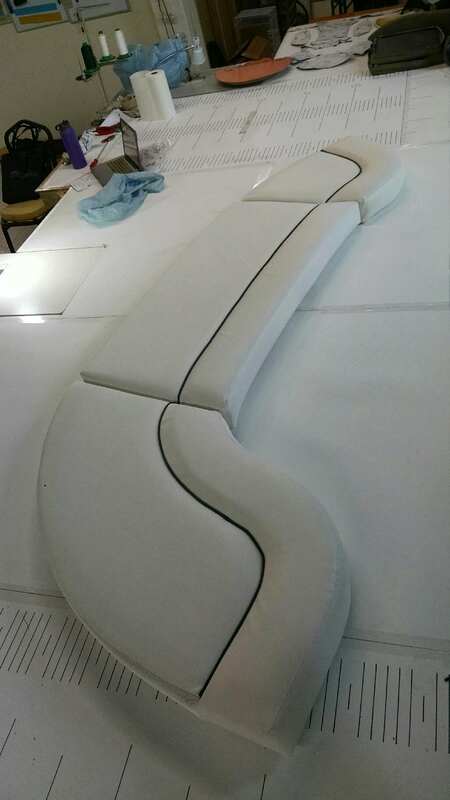 After coming up with the design, we brought the computer to our plotter and drew the pattern out onto the new fabric the customer chose which was Infinity Fabrics Superior Upholstery Vinyl. Then we cut it out, and sewed it all together. Recently a customer reached out to us about wanting a new sunpad. His was covered in dirt, debris, and mold from being out on his boat for so many years. He decided he wanted the same exact look as his old ones, and even wanted to keep the old foam. Some of his foam was moldy, so we had to use a mixture of 50/50 bleach and water to spray the foam down to make it safe to use again. After we prepped the old foam, we got measurements using our 3d measuring device to start the design process for the cushions. After that we started sewing the new cushion covers together. These cushions are created out of Infinity Fabric Superior Upholstery Vinyl! The bottoms of these cushions are all screen with an U shaped zipper to help easily remove the big piece of foam for easy access. The screen also helps with water drainage to help allow the cushion to have some breathing room which will help prevent mold in the near future. 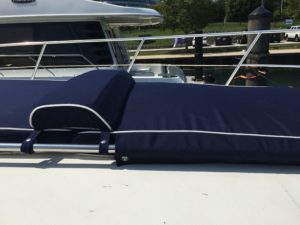 We also added straps along with DOT Twist Lock fasteners to the cushions so they can be secured to the boat so they won’t go flying anywhere when you are on the move! 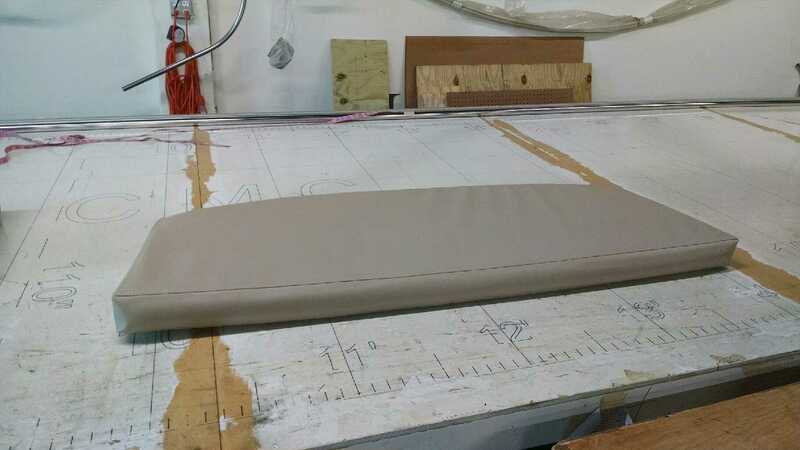 Today we recreated three box cushions for a customer using Infinity Fabrics Superior Upholstery Vinyl in the color LTH04, which is a brownish tan color. We used Sunguard Oyster UVR bonded polyester thread which is great to use on things that are going to be exposed to a lot of sunlight and weather of all kinds. Sunguard is twisted and bonded in a certain way that the thread will have the best quality colorfastness and performance when in use. It is an anti-wick thread which helps reduce seam leakage. Its a great strong thread to use on cushions that are going to be outdoors when you are on your boat! 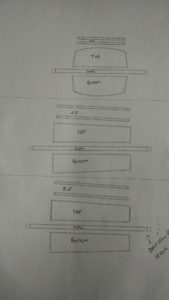 Using our 3D measuring device, we took measurements of the old cushions to assure that these new ones would fit the right dimensions. 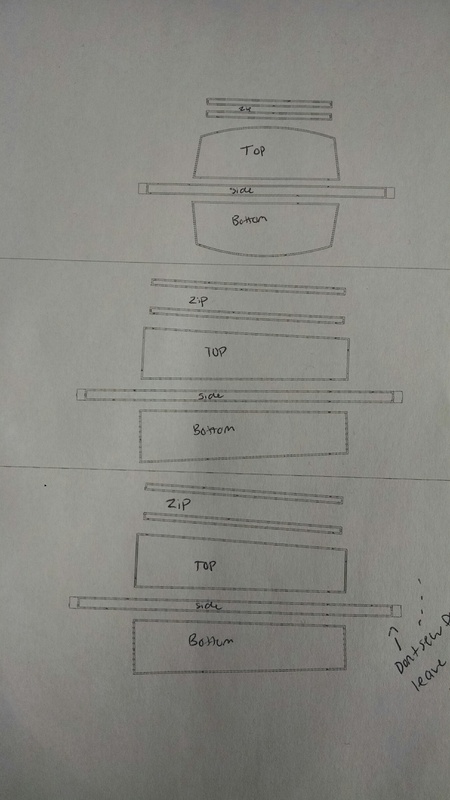 Then we took those measurements to the computer and used CAD to finish up the design process to make sure everything was perfect. 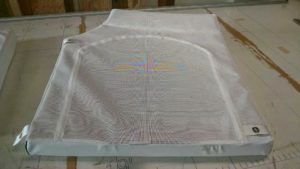 After that we draw the pattern out onto the fabric with our plotting machine and then we hand cut the fabric. 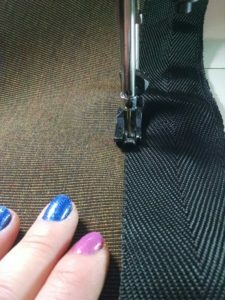 The first step for sewing these together is sewing the zipper part of the cushion. machine to give the cushion a nice finished look. For these, we just sewed the seam up to the top and bottom of the cushion, so if any water were to get on the seats, it would roll over the edge, instead of getting stuck in the seam! 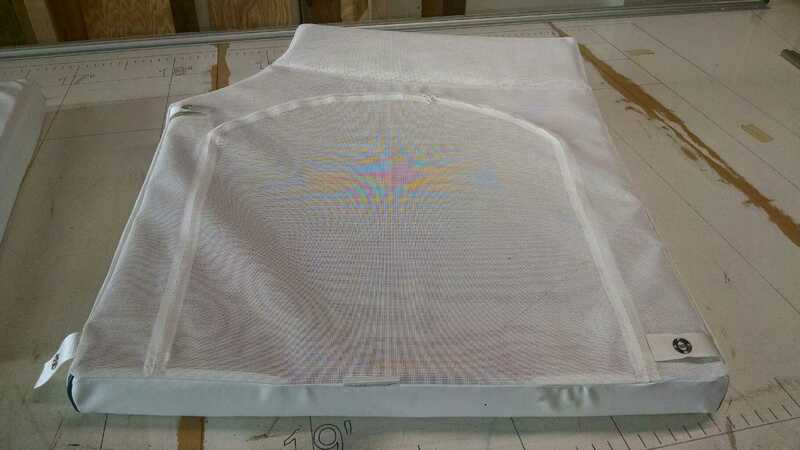 We often fabricate custom outdoor grill covers for customers in the Chicagoland area. 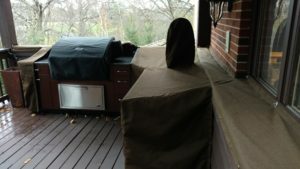 These covers protect the counter tops, sinks, grills, and cabinets from the different weather changes here in Illinois. Things like snow, water, ice and dirt can make your grill and your beautiful cooking area have a shorter life span. With a custom cover, you can help protect your investment! All of our covers are custom made. We start off all of our jobs by going out to our customers house to take measurements using our 3D measuring device. This is one of our many labor-saving, cost-effective tools that we use here at Chicago Marine Canvas. With this tool, we can quickly take measurements, rain or shine, even with Chicago winds! After we gather all of our measurements, we head back to our shop and our designer starts the design process. Our designer uses CAD (Computer-Aided-Design) Software to draw up your new cover. With this program, we can see everything in 3D, allowing us to make sure that our customers cover is perfect and just how they want it. 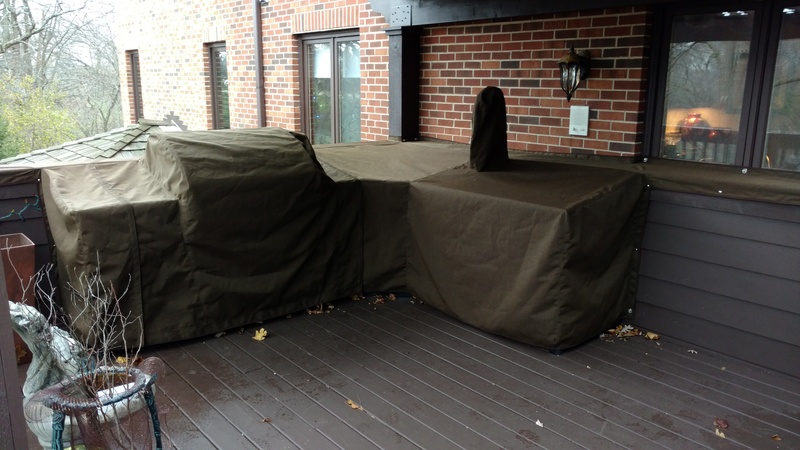 For this cover, we made sure that the grill could still be accesses if needed in the winter. 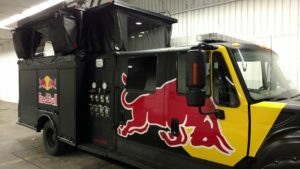 So we made sure to add zippers on both sides of the grill so the grill area can be exposed and can be used all year round. For this outdoor grill cover we used Sunbrella fabric in Walnut Brown Tweed. Sunbrella fabric is fade resistant and comes with a 10 year warranty. 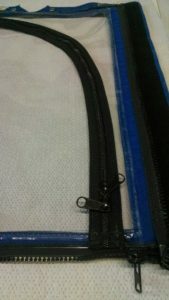 We used Lenzip Zippers for the easy access flap. We also put black webbing along all of the outside edges of the cover so we could put snaps to attach the cover securely to the home, deck, and grill area! 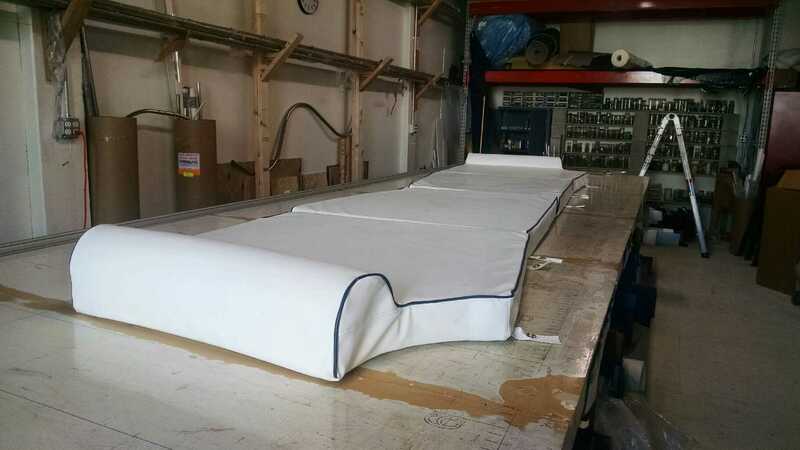 Making sure that your cover will not go flying away in Chicago winds!